This seminar will provide you with an enhanced experiential sense of mindfulness, as well as specific tools you can use right away in working with a broad range of client issues. You will leave this seminar refreshed and re-energised about your clinical work. Two of the most significant developments in psychotherapy in the last 10 years have been the emergence of mindfulness and the impact of significant advances in neuroscience. Mindfulness is now an essential aspect of many accepted therapeutic modalities. 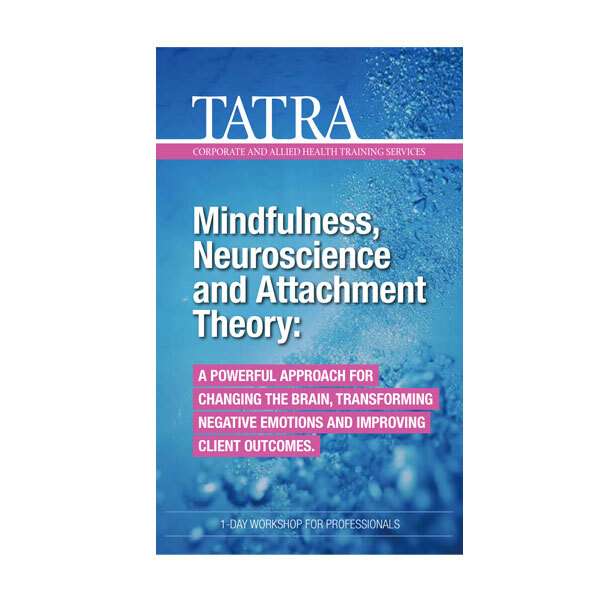 Moreover, advances in neuroscience and attachment theory have led to revolutionary work in the application of mindfulness in the treatment of anxiety, depression emotional dysregulation, anger and stress. In this seminar, we explore an integrated approach — incorporating advances in neuroscience, new insights about attachment theory and The Five Core Skills of Mindfulness — that accelerates healthy change and improves client outcomes. Terry Fralich discusses practical insights, language and techniques that will strengthen your professional confidence and effectiveness. This seminar will provide you with an enhanced experiential sense of mindfulness, as well as specific tools you can use right away in working with a broad range of client issues. You will leave this seminar refreshed and re-energised about your clinical work. Although there is some overlap regarding fundamental skills of mindfulness from Terry’s training two years ago, this program offers new insights, techniques and practices for anyone interested in mindfulness in their personal and professional lives. The new training brings special emphasis on how we can effectively bring mindfulness into the therapeutic environment to help clients change their brains, transform negative patterns and feel more confidence.